You are here: Home > MCSD News & Alerts > MCSD News & Alerts > 2017 Happy Holidays Kids Cooking Class! 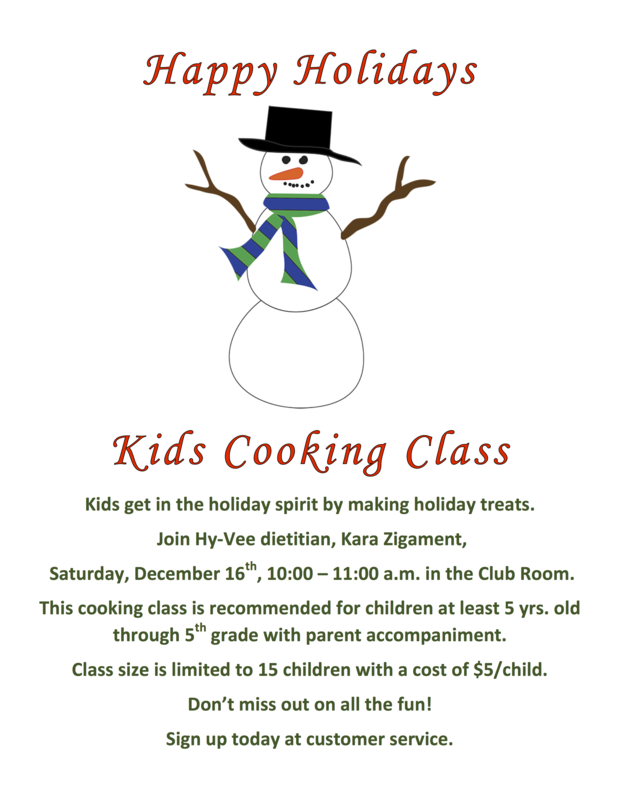 Happy Holidays Kids Cooking Class – Kids get in the holiday spirit by making holiday treats! Join Hy-Vee dietitian, Kara Zigament, Saturday, December 16th, 10:00-11:00 a.m. in the Hy-Vee Club Room. This cooking class is recommended for children at least 5 yrs. old through 5th grade with adult accompaniment. Class size is limited to 15 children with a cost of $5/child. Don’t miss out on all the fun! Sign up today at customer service.